Will Faraday have a Nevada factory? : Luxury electric carmaker Faraday Future may be losing support for its $1 billion electric car factory in North Las Vegas. Nevada State Treasurer Dan Swartz is concerned that Faraday or its billionaire backer, Jia Yueting, founder of Chinese Internet company Leshi, will not be putting up at least $70 million to insure Nevada’s infrastructure investment. Nevada has been under scrutiny lately for incentives to attract outside companies like Faraday Futures and Tesla Motors to set up shop in the state. Tesla and the state government have been defending the $1.3 billion tax incentive package the company was awarded by Nevada lawmakers to bring its Gigafactory lithium ion battery plant to Nevada. The state is offering Faraday $217 million worth of incentives including the infrastructure – roads, a rail line, and water pipes. Faraday will be funding the $1 billion plant. Nevada wants the $70 million from Faraday as security in case the manufacturing plant doesn’t come through. Uber driver shooting spree: Ridesharing giant Uber may need to revise hiring standards on its drivers following a horrible killing spree in Kalamazoo, Mich., by an Uber driver. Suspected gunman Jason Brian Dalton, 45, killed six people and wounded two on Saturday night over a 12-mile series of shooting rampages. It ended with the fatal shooting of a father and son browsing the brightly-lit parking lot of a Kia dealership, police said. Local authorities believe Dalton was transporting Uber customers and pocketing fares between the shooting episodes. Uber has confirmed Dalton had passed a background check. EVS29 coming up in June: All elements of the electric drive value chain will be represented at the 29th International Electric Vehicle Symposium in Montreal. EVS29 is expected to bring together about 2,000 attendees, including R&D experts, leading manufacturers, top industry executives and government partners from around the world. The event will take place June 19-22, 2016. “EVS29 is the largest global event showcasing electric drive technologies, where we will hear from the experts on technology, trends and continued growth in the industry, exhibitors will offer a hands on experience with their products and services and attendees can test out the latest models and charging equipment at the Ride, Drive & Charge.” said Genevieve Cullen, president of the Electric Drive Transportation Association (EDTA), the U.S. association dedicated to advancing electric drive technologies and organizer of the symposium. Visit www.evs29.org to register or to learn more about sponsorship, exhibition opportunities, and media credentials. Koch brothers backing pro-petroleum campaign: A new political advocacy group supporting petroleum transportation fuels and attacking electric vehicle incentives may by rolling out soon. The new group is being backed by brothers Charles and David Koch, prominent donors to conservative causes. Charles and David Koch lead Koch Industries, the nation’s second largest privately held companies; much of its revenue comes from producing petroleum fuels. A Koch Industries board member is working with a lobbying who used to head up the American Fuel and Petrochemical Manufacturers to start up the new advocacy group, according to The Huffington Post. The new group may be spending about $10 million a year for its lobbying and marketing efforts. New EV partnership: Aston Martin has set up a venture with Chinese technology group LeEco to jointly develop the British luxury car brand’s first electric vehicle based on its Rapide S. “It brings Aston Martin’s electric car project forward,” said Aston Martin CEO Andy Palmer (and former Leaf advocate in his role as Nissan’s chief planning officer). 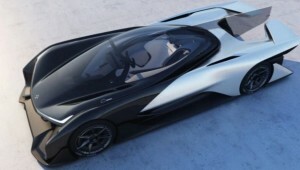 The joint venture also plans to collaborate with electric carmaker startup Faraday Future. Automotive Digest resources: Green Auto Market’s media partner, Automotive Digest, has been reorganized with more emphasis on next-generation automotive technologies – autonomous vehicles, digital marketing, connected cars, and other popular auto industry topics like vintage and classic cars, technology trends, and profiles of influential industry leaders. Take a look at Upcoming Industry Events, which tracks all of the significant automotive events including conferences focusing on clean transportation and fleet management. You can also view links to Green Auto Market and its stories of the week. Automotive Digest also promotes media partners, Fleet Management Weekly and Used Car Market Reports. Check out the latest in video interviews on AD.com, FMW, and UCMR. The U.S. Department of Energy’s Advanced Research Projects Agency-Energy (ARPA-E) will host its annual Energy Innovation Summit from Feb. 29-March 2, 2016 at the Gaylord National Resort & Convention Center in National Harbor, Md. Featured Technology Showcase demos and displays include: air and ground robotics display for bioenergy crop breeding; a personalized wireless heating and cooling device for building efficiency; a converted shipping container with solar charging station for four Current Motor Electric Cargo Motorcycles; aerial robotics systems for natural gas monitoring; and a Ford F-150 adapted with an adsorbed natural gas system. Transportation and climate change: University of Michigan’s Transportation Research Institute has published a report in support of the 2015 Paris Agreement of the United Nations Framework Convention on Climate Change. The focus of this study was on actions individual Americans can take without a major change in lifestyle to assist in meeting the Paris Agreement, with transportation providing the most viable option. The study concludes that if the average U.S. fuel economy increased to 31 mpg, total U.S. emissions would be reduced by 5%. If the average fuel economy were 56.0 mpg, total U.S. emissions would be reduced by 10%. Toy version of Model S: Tesla Motors may have found a tactic for winning over future car owners. Radio Flyer Inc., an American toy company best known for its popular red toy wagon, has collaborated with Tesla to create a drivable miniature version of the Model S for children. The ‘Model S for Kids’ ages 3 to 8 comes in real Model S colors. It has working headlights, a front trunk, or “frunk,” and a place to plug in a portable music player. It has a maximum weight capacity of 81 pounds. Electric bus contract: China-based BYD is bringing electric buses to Antelope Valley Transit Authority, located north of Los Angeles. The authority has approved a measure to purchase as many as 85 all-battery buses to be built at BYD’s new facility in Lancaster, Calif., based in Antelope Valley. About $72 million will be spent on 40-foot battery buses, 45-foot over-the road coaches, and BYD’s and the industry’s first-ever all-battery 60-foot articulated transit bus. Volkswagen AG is facing a catastrophe that will probably take years to recover from. The outcomes of government agency rulings, recalls, and class-action lawsuits will tap into VW’s cash reserves – and will dictate its future strategic planning. It’s the “perfect storm” as automakers compete to dominate global markets; compliance with national emissions standards, for the most part, is being enforced; OEMs face unattainable expectations on advanced technology innovations; and consumers expect major corporations to live with a fairly high level of accountability and transparency. EVs and charging could be a solution: As part of its ongoing talks with VW on fixing the diesel vehicle reporting problem, the U.S. Environmental Protection Agency has asked the German automaker to produce electric vehicles in the U.S. as a way of making up for its emission testing and reporting violations. This news came from German newspaper Welt am Sonntag, which reported that the EPA was asking VW to produce electric vehicles at its plant in Chattanooga, Tenn. Another layer to the settlement would be VW helping build a network of charging stations for electric vehicles in the U.S. It wasn’t clear whether this resolution would come from current VW models or new ones that would be introduced to the market. The automaker and EPA declined to comment. “Talks with the EPA are ongoing and we are not commenting on the contents and state of the negotiations,” a VW spokesman said. Facing EPA and CARB scrutiny: Earlier this month, VW submitted its draft recall plan for about 85,000 VW, Audi and Porsche diesel vehicles to the U.S. Environmental Protection Agency and California Air Resources Board. CARB rejected VW’s plan in January to fix these vehicles. CARB said the plan did not meet its standards and called it “unacceptable.” On Feb. 3, CARB said that it had up to 20 business days to test if the revised plan actually reduces emissions; and the EPA will probably back CARB’s decision. 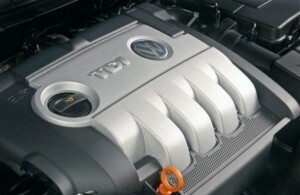 If the new plan is accepted, VW could begin a recall and end the stopped sale of vehicles with these engines. “Denial” and “obfuscation” continue to be commonly used words to describe VW’s state. 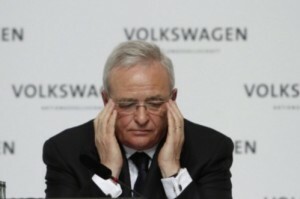 Former Volkswagen Group CEO Martin Winterkorn (as seen in the photo above) may take more of the blame, as has been expected. Media has reported that Winterkorn was notified as early as May 2014 about the inevitable investigation U.S. authorities would put in motion on the diesel car emissions-test defeat device placed in several VW, Audi, and Porsche models. Volkswagen internal memos and emails suggest that Winterkorn and other company executives pursued a strategy of delay and obfuscation. The automaker would not be able to provide an explanation for elevated nitrogen oxide emissions and deceptive emissions reporting data. Winkerton resigned on Sept. 23, 2015, and said at that time that he didn’t find out about the defeat device until right before the company’s response to EPA’s recall announcement. Class-action lawsuits: Dozens of class-action lawsuits filed nationwide on behalf of hundreds of thousands of angry Volkswagen owners, dealers, and other parties have been centralized in San Francisco federal court. Attorneys have been in communications on the best strategy to hold VW accountable in a case with billions of dollars at stake. It’s considered to be in the process of becoming one of the most massive legal assaults in U.S. history. All of the cases against VW have been assigned by a special national panel to San Francisco U.S. District Judge Charles Breyer. Daimler is facing its own accusation that it utilized a shut-off device in emissions testing. The German automaker said that a U.S. class action lawsuit alleging that its Mercedes-Benz diesel cars use a device that turns off pollution controls is inaccurate. Consumer-rights law firm Hagens Berman Sobol Shapiro filed a lawsuit in a federal court in New Jersey alleging that Mercedes has placed a shut-off device in its BlueTec “clean diesel” cars that causes the vehicles to violate U.S. emissions standards when running at cooler temperatures. Daimler spokesman Joerg Howe said the company is complying with regulatory frameworks and all its vehicle are certified according to all the laws that it’s required to comply with. Daimler may be going in a similar direction as VW in cleaning up its image as a responsible, sustainable company. VW may need to manufacture more EVs in the U.S. as part of its EPA settlement. Daimler just decided that its executives must drive a battery electric vehicle or plug-in hybrid vehicle at the Stuttgart, Germany headquarters. These will be their company cars and it’s thought to be part of Daimler’s strategy to give its management more experience with plug-in electric vehicles. Former General Motors vice chair Bob Lutz says that years ago he and his colleagues had been mystified at VW’s ability to build diesel cars that could pass stringent emissions tests. When Lutz served as GM’s “car czar” from 2001 to 2009, he had GM engineers analyze Volkswagen’s TDI models to see how the German automaker managed to meet U.S. emissions standards. Lutz wanted GM to sell more diesel cars in the U.S. GM staff couldn’t figure out how VW was able to meet the particularly strict standards in California, Lutz said. GM and its competitors wanted to build fuel efficient cars with strong engine performance; but they left diesel passenger cars to VW to take the lead. Lutz has always supported plug-in hybrid electric vehicles (such as the Chevrolet Volt and Via Motors vehicles). Global sales: VW had been aiming to retain its number one spot in global auto sales, but that took a sharp turn after the news broke out in September. There’s been a lot of media coverage recently with a humorous twist. Car sales may be down, but wiener sales have gone up. Last year, VW’s car deliveries fell about 5% from 2014 to 5.8 million units; during that year its currywurst wiener output climbed 14% to 7.2 million sausages. Beyond that story, here’s the numbers on VW’s sales performance: In January, according to figures released by the European Automobile Manufacturers Association, overall new car registrations in European Union nations rose 6.2% while registrations of VW-brand vehicles fell 3.8%. VW brand’s market share in the EU fell 1.2 points year over year, to 11.7%. VW still has the commanding lead in the EU and its Audi brand did well, increasing 13.7% in January. Its sales fell 7% in the U.S. in January after the automaker had to halt sales of several models over the scandal. The automaker’s global sales rose 3.7% in January, as it still holds a strong position in a few overseas markets, especially China. The automaker sold 847,000 vehicles worldwide in January, up from 817,000 in the same month a year earlier. Diesel car sales: VW and Audi diesel car models had been dominating diesel passenger car sales in the U.S., but that’s taken a downward turn since September. In January, automakers sold fewer than 225 diesel cars compared to somewhere between 4,800 and 9,500 a month through the first eight months of 2015, according to WardsAuto.com. Diesel-engine pickups are still doing pretty well (which GM and Chrysler had been counting on). Automakers sold 21,999 diesel light-trucks in January. Taking the heat in South Korea: South Korean government prosecutors raided and searched VW’s Seoul headquarters and other South Korean offices. Computer hard drives, emails exchanged with headquarters, emissions verification, and vehicle certification information were confiscated by investigators during the search. The homes of VW executives in charge of product quality control were also raided. “We have made (it) clear that we will fully cooperate with the investigation and our position remains unchanged,” a Volkswagen spokesman told the AFP news agency. VW has indefinitely postponed its fourth-quarter and full-year 2015 earnings reports as it scrambles to adjust its financial reporting to include the spiraling costs of the scandal. Some analysts are speculating that CEO Matthias Mueller is working behind the scenes to get to a settlement with the U.S. government that VW can charge against its 2015 earnings. The idea is that these negotiations could help get the company past the scandal more quickly – and it could help speed its efforts to recover its reputation with consumers around the world. That’s a very tall order for VW to face. Digging into EV sales forecast: Manheim’s annual Used Car Market Report made a surprising forecast last week: By 2025, electric vehicles (EVs) are expected to make up 25% of global auto sales, and 30 million new EV units will be produced that year. 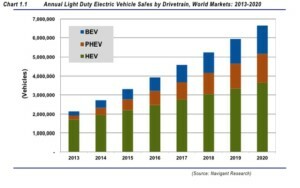 How accurate could this be, with global EV sales reaching about 520,000 units last year, global new vehicle sales hitting around 89 million in 2015, and 2025 coming up in nine years? Manheim thinks that incentives will play a big part, including government programs such as federal tax incentives and state rebates (with California, Washington, and Colorado currently offering the most robust incentives). Population migration to cities will be another driver with cities becoming denser, which is likely to drive adoption of cleaner vehicles and carsharing, both of which will benefit EV sales. Curious about this forecast, I dug into the footnotes. For the 25% of global sales forecast, Manheim cited the “Cars 2025” study by Goldman Sachs. One important distinction is that Goldman Sachs included hybrid vehicles in that sales forecast numbers: “Regulations on fuel economy and CO2 emissions are forcing carmakers to make engines more efficient. By 2025, 25% of cars sold will have electric engines, up from 5% today. But most of those will be hybrids, and 95% of cars will still rely on fossil fuels for at least part of their power.” The most telling statement from the Manheim report is how many EVs are being leased now versus purchased – 75% of EVs are being leased versus 28% of traditional cars sold in the U.S. This glut of off-lease EVs will create a real challenge for remarketers in managing the inventory and strengthening their resale values. Air travel emissions rules: The United Nations has drafted the first-ever carbon emissions rules for airplanes which still need to be finalized. Proposed rules from the International Civil Aviation Organization (ICAO) would apply to all new airplanes delivered after 2028. Planes delivered after that date would need to have a 4% reduction in emissions of carbon dioxide and other substances compared to 2015 airplanes that were delivered to buyers. The new rules would also set limits for airplanes already in production that would be delivered after 2023, with emissions reductions of 0 to 11%, depending on a plane’s size. Reducing emissions has been a priority for a few stakeholders in aviation. Several major airlines have already adopted test programs using jet biofuels. Volt system going to other OEMs? : The second-generation plug-in hybrid system built into the 2016 Chevrolet Volt is being shared in other General Motors’ products (2016 Chevrolet Malibu Hybrid, 2017 Cadillac CT6 Plug-in Hybrid, and the Opel Ampera-E in Europe). GM is likely ready to sell the alternative powertrain system to other carmakers as well. Dan Nicholson, GM’s global powertrain chief, recently made comments about partnering with other OEMs in this era of higher fuel-economy rules and multiple advanced technologies. To meet stringent national standards in fuel economy and emissions, some smaller Asian automakers (Mazda and Subaru among them) are expected to go with the next-gen Toyota plug-in hybrid system. In this competitive market with global alliances, GM is preparing to work with other OEMs. Million miles traveled in fuel cell cars: Hyundai Tucson Fuel Cell drivers have accumulated more than 1,000,000 miles on the roads and highways of Southern California since introduction of the hydrogen-powered car in June 2014. The first mass-market produced fuel cell vehicles has been sold to nearly 100 owners so far. Hyundai reported that approximately 385 tons of CO2 emissions that would have been emitted from vehicles of similar size were displaced during those million miles. Toyota and Honda fuel cell vehicles have been grabbing a lot of media attention recently, but Tucson Fuel Cell crossover models have been on the roads for a year and a half. SEMA challenges EPA rules: The Specialty Equipment Market Association, which represents aftermarket parts companies and puts on the popular SEMA Show, is taking on U.S. Environmental Protection Agency rules on converted aftermarket vehicles. SEMA is challenging language that would be added to current auto emissions rules that ban tampering with or disabling emissions control systems on passenger cars and engines, including vehicles intended solely for racing. The EPA says the new language merely clarifies a prohibition that has long been agency policy. It will be part of a heavy-duty vehicle emissions rule that EPA will issue in July, which includes a separate exemption for “nonroad” vehicles, such as all-terrain vehicles, snowmobiles, and dirt bikes. SEMA has warned that the rule would expose racers and some aftermarket companies that serve them to penalties and reverse decades of agency policy on the issue. Clean Power Plan put on hold: The Obama administration’s Clean Power Plan has been put in limbo by the Supreme Court. The climate change policy affecting energy utilities has been placed on temporary halt while an appeals court considers a legal challenge to the rule aimed at regulating coal-burning power plant emissions. Since the U.S. Environmental Protection Agency published the rule in late October, more than 20 energy companies, other businesses and industry organizations, along with 27 states, have filed lawsuits to overturn it. RNG sales climb: Clean Energy Fuels Corp. announced that sales of Redeem, its renewable natural gas (RNG) vehicle fuel, more than doubled in 2015 to 50 million gasoline gallon equivalents (GGEs) from 20 million GGEs in 2014. Redeem sales have expanded from Clean Energy public-access stations in California, to become the contracted fuel choice of customers like UPS, Republic Services, the City of Santa Monica’s Big Blue Bus, the University of California San Diego and others. Sales also have recently expanded into Oregon and Texas. Operating AFV maintenance and fueling sites: On March 3, ACT Expo will host another webinar with this one featuring guidelines on setting up maintenance and fueling facilities for alternative fuel vehicles. William Davis, director of the National Alternative Fuels Training Consortium (NAFTC), will help provide information about the necessary fueling and maintenance facility modifications for alternative fuel vehicles, including natural gas, hydrogen, propane, biofuels, and electric drive vehicles. 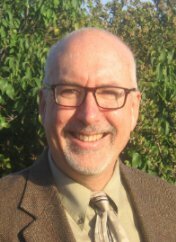 Davis has been with the NAFTC for 16 years, and oversees daily operations of the NAFTC and its member educational institutions. Kia takes on Prius: Kia is increasing competition with the Toyota Prius lineup with additions to its green cars. At the Chicago Auto Show, Kia unveiled the 2017 Optima Hybrid and Optima PHEV plug-in hybrid that can travel 27 miles on electricity alone. Kia also introduced the Niro, the company’s first dedicated hybrid nameplate. It’s part of a $10 billion plan through 2020 Kia introduced last fall. It will increase its fleetwide fuel efficiency by 25%, helping the company to satisfy stricter environmental regulations around the world. Daimler diesel cars: Daimler seems to be finding opportunity opening up in the diesel car space as Volkswagen struggles through its disaster. Daimler will be spending 6 billion euros ($2.94 billion) by 2019 on developing next-generation diesel engines to help the automaker to meet new pollution-measuring standards. Daimler will introduce selective catalytic reduction (SCR) on its smaller Mercedes-Benz front-wheel-drive compact cars by 2019; that will replace current nitrous oxide trap exhaust systems, the company said. Stock prices have dropped. The share price closed at $151.04 on Friday after having hovered around the $200 per share mark for several weeks. The high point reached in the past year was $286.65 per share. The fourth quarter earnings report last week was strong enough to get shares to jump nearly 6% to 10% on Thursday, but they declined again on Friday. The upcoming launch of its Model 3 and strong results from its energy storage division have helped, but analysts and large investors now think that prior price targets needed to be adjusted downward. 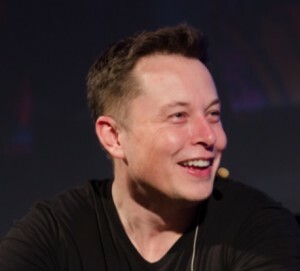 Tesla’s market cap is now at about $20 billion. By the numbers. Tesla said net loss nearly tripled to $320.4 million, or $2.44 per share, in the fourth quarter from $107.6 million a year earlier. The cost of launching its Model X crossover has taken its toll. The company will be spending $1.5 billion on machinery and equipment to manufacture the Model 3, and to enhance cell production at the Gigafactory. Competitive pricing on Model 3: Tesla will begin taking pre-orders of its Model 3 next month, which will be selling for $35,000. With incentives, that could drop down to as little as $25,000 in its closing price. That will be price competitive with the upcoming Chevrolet Bolt battery electric car, which may open at $30,000 before incentives. Tesla has managed to do very well selling its Model S in the $80,000 to $90,000 price range; and its newly launched Model X crossover is starting at around $80,000. Tesla’s creative leasing programs with bank partners such as Wells Fargo have helped close sales transactions. Eyes will be on Tesla on March 31 when it reveals the design and details of the upcoming Model 3. Performance in 2015: Last year did look good in sales performance for Tesla with revenue up 59% over 2014. Model S sales increased 35% in the fourth quarter compared to Q4 2014. The company set a record for deliveries in the fourth quarter even though gasoline prices were way down. To better service its electric cars, Tesla will be opening about 80 retail locations and service centers and adding 300 more Supercharger locations. Energy storage: During its quarterly report, the company announced that its Energy division has installed its first Powerwall home-battery storage units in the U.S., Australia, and Germany. More on the Volkswagen diesel emissions scandal……… Frank Tuch, previously head of VW’s group quality control, has left the company with details yet unknown beyond Tuch leaving “to take on new responsibilities elsewhere.” Tuch was appointed in 2010 by former CEO Martin Winterkorn, who did take partial blame for the scandal and left the company in September. Current CEO Matthias Mueller has been overhauling senior management positions in the wake of the emissions test-rigging scandal……… VW will be offering compensation packages to about 600,000 Americans who own one of these TDI diesel cars violating emissions limits. The U.S. attorney is finalizing the package and it’s not yet clear whether this will be a buy-back, cash, car replacement, repair, or some combination……… The European Union has become more flexible about considering new emissions rules soon after a protest measure was rejected by lawmakers. The new rules may be flawed, but lawmakers believe they will at least provide some greater regulation of emissions testing, according to Giovanni La Via, chair of the EU’s Environment Committee. Members of the European Parliament recently rejected a proposal to require on-road emissions testing for new vehicles. SDG&E installing 3,500 chargers: San Diego Gas & Electric has received regulatory approval to install up to 3,500 electric vehicle charging stations at 350 sites. The California Public Utilities Commission has approved its Electric Vehicle Grid-Integration pilot project, which may cost SDG&E $45 million to construct. The power utility thinks it’s a great opportunity to maximize use of renewable energy to charge EVs and reduce the need for new fossil-fuel power plants. That follows Southern California Edison winning CPUC approval for its $22 million “Charge Ready” initiative. SCE says it’s a pilot project installing up to 1,500 charging stations in its service territory. Incentives for fleet EV acquisition: Nissan’s Marc Deutsch and GNA’s Joe Annotti will be covering critical issues fleets face in deploying plug-in electric vehicles. ACT Expo is hosting a complimentary, one-hour webinar, which will highlight key incentives that help to substantially buy down the cost of electric vehicles, charging, and other costs of traditional vehicle ownership to maximize fleet deployment. Deutsch will be talking about significant fleet incentives; and Annotti will go over GNA’s Funding 360° Program that helps companies, municipalities, and organization track, evaluate, and apply for funding programs throughout North America. Click here to register for the free webinar, “Making Cents of Electric Vehicles: Key Incentives for Fleet Deployment,” which takes place tomorrow, Feb. 10, 2016, at 10:00-11:00 a.m. PT. Leaf turns around in used values: The Nissan Leaf has seen a reverse in its used vehicle valuation dilemma. During the fourth quarter of 2015, Kelley Blue Book Auction Values on model-years 2012 through 2015 Leafs were up three percent from where they were in the third quarter. That was while gasoline prices continued to plunge – 14.2%, or 32 cents, during that time period. “This rebound could be attributed to consumers now finding the current value of electric vehicles more attractive at their current price point following months of steady declines,” KBB analyst Sean Foyil said in the latest edition of Blue Book Market Report. That was during a time period when most used vehicles saw prices dropping as off-lease vehicle returns oversupplied the market. Goodbye Cadillac ELR: Cadillac won’t be building the next-generation version of its plug-in hybrid luxury ELR model. It has been released as a 2016 model year car, but General Motors hasn’t announced when it will be pulled off the market. It gained a lot of attention when launched as a 2014 model year electric vehicle with a $76,000 price tag. It was the only competitor out there, at the time, to the Tesla Model S. GM didn’t produce very many of them, and sales numbers were slight. It runs off a powertrain similar to the Chevrolet Volt, and it did get a lot of raves when it was first launched. Oil tax in budget: President Obama today will be proposing a tax of $10 per barrel on oil in the 2017 budget to Congress. The goal is to create “a clear incentive for private-sector innovation to reduce our reliance on oil, and at the same time invests in clean energy technologies that will power our future,” the White House said. Tax proceed would go to the nation’s transportation infrastructure and to reduce emissions of carbon dioxide from transportation. That proposal could be killed off in the Republican majority House. “President Obama’s proposed $10 per barrel tax on oil is dead on arrival in the House,” House majority whip Steve Scalise (R-LA) said. RMI on fuel price increases: As we’ve seen clearly in the past year, rapidly declining gasoline and diesel fuel prices can hurt sales of, and support for, plug-in electric, hybrid, and alternative fuel vehicles. Amory Lovins, chief scientist at Rocky Mountain Institute, thinks that these market conditions are set to turn around. Read on for his perspectives. Army testing autonomous vehicles: The U.S. Army is going back strong to its R&D efforts that started in the 1980s. The Army recently has been testing convoys of autonomous vehicles that follow a truck driven by a human. These tests have included up to 10 vehicles equipped with cameras, radar and onboard computers to identify potential road hazards. The equipment is costing the Army about $175,000 per vehicle; the Army thinks this will go down to one tenth that cost once it becomes mass produced. Uber taking heat for changing logo: Along with increasing “surge pricing” that is driving up the cost of Uber trips, the latest controversy on the ridesharing giant is that its emblem has been changed dramatically. The title of a Washington Post piece tells the story, “Why everyone hates Uber’s new logo.” Riders has grown accustomed to its grey “U” logo. At the beginning of this month, the logo on the mobile app transformed into a circle with a thin line through the left side; and it rests within an aqua green background with etchy, thin lines in some sort of diagram. It could be the logo for any company, and the iconic U has gone away. Automakers have understood for years that California, and the overall U.S. market, can’t be depended upon for meeting large-scale sales targets in plug-in electric vehicles. The decline in U.S. sales numbers during 2015 didn’t help, but the overall sales volume had still been small enough for automakers to question their future plans. That’s where global markets have become more important as OEMs look to sell enough volume to justify the resources invested in electric cars through talented employees, R&D, safety and performance testing, marketing spend, and setting up assembly plants to reach economies of scale. That has been the case for Tesla Motors along with its major OEM competitors, which makes China and other overseas markets even more important. So how did 2015 go in the top 10 markets for EV sales? China made up 34.2% of global plug-in electric vehicle sales last year with 176,627 sold and finished in first place. It’s been heavily subsidized by the national government and local branches. There’s been an assumption made that the market’s EV sales will continue to grow – enough for Tesla Motors and other OEMs to invest heavily in the market. Subsidies for the “New Energy Vehicles” (NEVs) have started to decline. One assessment states that about $4.56 billion in local and central government incentives were spent last year. The government’s five year’s plan will see subsidies in 2017 and 2018 to be reduced by 20% from 2016 levels; and another 20% will be cut in 2019 and 2020. There have been reports made of fraudulent transactions last year and government agencies are conducting investigations. Sales numbers tripled last year, and the data may have been “padded” with some of the EVs being counted twice in the total. China’s NEV sales have seen rapid growth in the past two years thanks to subsidies and tax cuts. Air pollution in Beijing and other major Chinese cities have been driving the incentives and sales. Tesla Motors and BYD say car shoppers are more interested in owning an EV due to the air pollution – and its making for an effective marketing message. One of BYD’s online ads shows a man in a cloud of pollution calling for help from China’s fabled Monkey King hero. In October, Tesla CEO Elion Musk announced plans to open the first Tesla manufacturing facility in China, a move that could slash prices for the Model S by more than one-third. The automaker has also bee searching out Chinese manufacturing partners and seeking to streamline Beijing’s complex license-plate lottery for buyers of its cars. The U.S. was No. 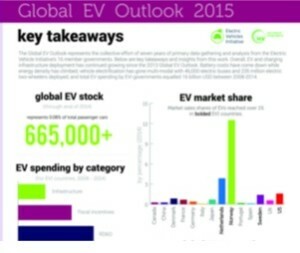 2 with 115,262 EVs sold in 2015, making up 22.3% of the total. China and U.S. are still the leading markets, making up more than 55% of global sales, combined. Sales softened for the first time last year in the U.S. with gasoline prices staying down and consumers waiting for new versions of the Nissan Leaf and Chevrolet Volt to roll out. Navigant Research’s John Gartner anticipates that sales volume will go back up in the next couple of years. By 2017, there will be several new EVs for consumers to test drive from Audi, BMW, Ford, GM, and Tesla. Expansion of the charging infrastructure is likely to increase EV adoption, as well. Survey results from Navigant have shown that U.S. consumers see the availability and inconvenience of charging PEVs as the main reasons not to switch from gasoline to electric powered cars. Automakers are joining up with government agencies, municipalities, and other entities to expand the charging infrastructure. Several automakers now include a free year of access to charging at dealerships and other locations when an EV is purchased. BMW and Nissan recently teamed up to deploy 120 DC fast chargers across country. Europe has seen substantial growth in EV sales; at about 75,000 new vehicles registered, it was nearly 50% higher last year in sales than was seen in the 2014 numbers. Seven of these nations made the top 10 EV sales list for last year with Norway, France, the U.K., and Germany accounting for about 75% of all registrations/sales for the year. The Mitsubishi Outlander plug-in hybrid has been the top seller in Europe. Mitsubishi, for now, has left the U.S. market for EV sales and is focusing heavily on Europe; with more than 50,000 units sold in that region since its launch in October 2013. German Chancellor Angela Merkel recently met with automaker executives on boosting incentives, but the meeting ended without a deal on subsidies being worked out. Merkel called the meeting with high-level executives at German automakers to discuss promoting EVs and hybrids following political pressures to “clean house” in the wake of Volkswagen’s admission that it cheated U.S. emissions tests for diesel-powered cars. OEMs would like to see government action to set up charging stations for electric cars and help fund sales subsidies. There’s been concern about Germany lagging behind other European neighbors in EV sales. Japan appears to be more focused on supporting growth in hydrogen fuel cell vehicle production, sales, and fueling infrastructure than in supporting EV sales. Toyota and Honda have been investing heavily in fuel cell vehicles and would like to see ample support from the government. Japan finished 2013 at second place in global EV sales, then dropped down to third place in 2014 and eighth place last year. The government has made some commitments to supporting companies in the EV space, including Panasonic and its EV battery technologies. South Korea didn’t make the top 10 list and probably won’t for a few years. Hyundai and Kia have been getting into the game during the past couple of years with the low-volume Kia Soul EV battery-electric car; the Hyundai Sonata Plug-In Hybrid; and the recently displayed Hyundai Ioniq that will eventually be released in hybrid, plug-in hybrid, and battery electric versions. So far, the most popular EV sold in the South Korean market has been the Renault Samsung SM3 ZE (known in Europe as the Renault Fluence ZE). The numbers haven’t been very high – with nearly 1,800 sold overall in the world since its launch two years ago. January EV sales: Plug-in electric vehicle sales saw the typical downturn pattern for the month of January. Winter Storm Jonas, which closed parts of the Eastern Seaboard for several days, has meant that less car shoppers have visited dealerships. With 2015 down slightly from 2014 in overall EV sales, January didn’t start this new year on a strong note. 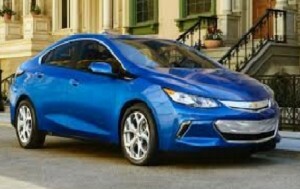 The Chevrolet Volt had the most sales in January at 996 cars sold in the U.S., up from 542 one year earlier. Sales strength was supported by the all-new Volt rolling out to dealerships, and winning Green Car Reports’ 2016 Best Car To Buy award. Tesla Model S came in second with 859 units sold in January, down from 1,100 sold in January 2015. The Nissan Leaf had 755 units sold versus 1,070 one year earlier. The recently launched Tesla Model X came in at number four with 370 units sold, up from 199 units sold in December 2015. Volkswagen e-Golf came in at fifth place with 328 units sold, up from 181 sold a year ago. ACEEE names Greenest and Meanest: Mercedes-Benz topped the Greenest and the Meanest categories in the 19th annual rankings released by American Council for an Energy-Efficient Economy (ACEEE). Mercedes-Benz’s Smart Fortwo Electric Drive tied the Chevrolet Spark EV for No. 1 on the Greenest List for 2016, with each ranked at 63 points on the ACEEE rating system. The 12-cylinder SUV, Mercedes-Benz G65 AMG, finished at the bottom of the scores with a 20, and topping the Meanest List for vehicles least friendly to the environment. Battery-powered vehicles were big on the Greenest list this year. For the first time ever, the list is completely populated by plug-in and hybrid vehicles. “Fortunately, the electricity sector is slated to become cleaner over the life of model year 2016 vehicles, thanks to the Clean Power Plan, and that has bumped up electric vehicles’ green scores this year. Nevertheless, it’s important to acknowledge that how green your electric vehicle truly is depends on the electricity it uses to charge,” said ACEEE lead vehicle analyst Shruti Vaidyanathan. Tesla applies for dealer license: Tesla Motors is trying to work around Michigan’s ban on OEMs selling directly to consumers by filing for a “Class A” dealership license to sell new and used cars in the state. Tesla initially filed in November and submitted follow-up information in recent weeks. A state spokesperson said a decision will be announced in one-to-two months from now. Companies granted the Class A dealership classification will also need to have a licensed repair facility in place, which Tesla has done in other states. Cruz takes Iowa: Ted Cruz (R-Tex. ), who has been opposed to the federal biofuels mandate, didn’t seem to be hurt by opposition received from the Iowa’s corn ethanol establishment. Cruz had about 28% of the vote, followed by Donald Trump at 24% and Marco Rubio at 23%.Iowa Gov. Terry Branstad had previously told voters that they shouldn’t vote for Cruz because of his opposition to ethanol. While the fuel is very important to the state’s economy, with 47% of the state’s corn going into ethanol, public opinion has changed since Barack Obama campaigned from a very pro-ethanol position in the 2008 primary. Analysts point to changing social conditions, including more Iowans moving to cities like Des Moines and working within a broader economic landscape than a state that had been driven entirely by agribusiness for many years. National Biodiesel Board convention: On the advanced biofuels front, the National Biodiesel Board celebrated growth in biodiesel production and consumption last year during its annual conference. The U.S. Environmental Protection Agency released 2015 volume numbers just prior to the convention, reporting that US consumers used a record of nearly 2.1 billion gallons of biodiesel last year. According to NBB CEO Joe Jobe, the numbers “show without question that the Renewable Fuel Standard is delivering significant volumes of Advanced Biofuel to the American people.” More than 1,000 biodiesel industry leaders and supporters attended the conference. Another newsworthy announcement: Peterbilt and Kenworth manufacturer, PACCAR Inc., now approve of B20 biodiesel in 100% of its vehicles, old and new; which means that over 100,000 new trucks are joining the biodiesel ranks, traveling over twelve billion miles year round. VW preparing for volatile shareholder meeting: Volkswagen is preparing to release the results of an internal investigation on the use of “defeat device” software to cheat on emissions tests, which will be released at the company’s annual shareholder meeting on April 21. VW’s leadership is preparing for what’s expected to be a tense session with shareholders. Dozens of large shareholders plan to sue VW in a German court, seeking compensation for the plunge in its shares due to its emissions test cheating scandal. VW’s investigation, conducted by U.S. law firm Jones Day, includes testimony from around 50 Volkswagen employees, who testified under amnesty granted by the company to induce them to talk. One employee testified that VW’s use of “defeat device” software was an “open secret,” which VW has denied, according to German newspapers. VW is investing more in electric vehicles, partially to repair its image as an environmentally responsible company. The all-electric Volkswagen BUDD-e may see production in the near future. Debuted last month at the Consumer Electronics Show, the BIDD-e would be built on the company’s Modular Electric platform. Batteries can be stumbling block: While Ford will be investing $4.5 billion in electrified vehicles to catch up with Tesla and GM, the company has been frustrated with the slowness of developing next-gen batteries. “Battery costs are not coming down fast enough to democratize it,” said Kevin Layden, director of Ford’s electrification programs. With no technology breakthroughs coming around the corner, Ford’s scientists and engineers are finding gradual ways to reduce the costs of lithium-ion batteries by 10% to 20% from one generation to the next, he said. That is reducing battery weight and cost while boosting power. New president follows Underwood: Energy Vision has named Matt Tomich, 29, its new president as founder Joanna Underwood steps down while continuing to retain her role as chair of Energy Vision’s board. Underwood has played a strong role in supporting development of renewable natural gas in fleet applications. In this Automotive Digest video interview, Underwood talks about how RNG, or biomethane, that comes from landfills, sewage treatment, and agriculture, turns expensive solid waste burdens for communities into clean, available fuels. Tomich worked with a pioneering green chemistry startup based in Kansas City before joining Energy Vision in January 2012. “I’m proud to be able to continue building on Energy Vision’s remarkable first decade,” Tomich said. Love’s acquires Trillium CNG: Love’s Travel Stops announced an agreement to purchase natural-gas fuel provider Trillium CNG for an undisclosed price. That will expand Love’s network of public access CNG facilities to 65 from 37. Chicago-based Trillium was acquired last year by WEC Energy Group. “Many of our customers, including fleets and motorists, appreciate the stable pricing that CNG offers, so we’ve remained committed to developing our CNG network,” Love said in a statement. Trillium designs, builds and maintains CNG facilities; the company has provided annual fuel deliveries totaling more than 55 million gallon equivalents of CNG. ExxonMobil exploring cellulosic fuels: ExxonMobil has an agreement with Renewable Energy Group to study the production of biodiesel by fermenting renewable cellulosic sugars from non-food sources such as agricultural waste. ExxonMobil is tapping into REG’s patented technology that uses microbes to convert sugars to biodiesel in a one-step fermentation process similar to ethanol manufacturing. This comes at a time when the oil company has been heavily criticized for possibly obscuring what it knew about the risks of climate change. Working with REG will accomplish the oil company’s goals of avoiding a biofuel that might have a major impact on food supplies; and “exploring future energy options with a reduced environmental impact,” said ExxonMobil Research and Engineering VP of research and development Vijay Swarup. General Motors Co. is betting big on its future in the fast-changing automotive space. Along with its investments in Lyft, Sidecar, and its Maven startup brand, GM has announced management changes to support its next-generation vehicle technologies. Doug Parks, GM’s vice president for global product programs, is now vice president for autonomous technology and vehicle execution. Parks will oversee projects to develop new electrical and battery systems and software for autonomous and electric vehicles, the company said. There are other executives taking positions in GM’s new Autonomous and Technology Vehicle Development Team with similar backgrounds in electric vehicles and technology innovations. There are other OEM executives who see a logical integration of electric and autonomous vehicle technologies. “The two most profound innovations in automotive since the moving production line are electrification and autonomy,” Tesla CEO Elon Musk said to Automotive News. Tim Lipman PhD, Co-Director at the Transportation Sustainability Research Center, UC Berkeley, sees a “nexus” between autonomous and electric vehicles. Lipman spoke on a panel that I moderated last fall that was part of the Northern California Clean Technology Forum hosted by the Sacramento and East Bay Clean Cities Coalitions. Autonomous vehicles are ideal for charging the electric vehicles most efficiently, such as during off-peak hours, Lipman said. Electric vehicles are easier to control and maintain than traditional internal combustion engine vehicles. Electric autonomous vehicles would be ideal for meeting energy efficiency and environmental targets in a fleet, he said. It’s all part of a larger trend that UC Berkeley’s Transportation Sustainability Research Center is tracking as cities continue to grow in population; increasing traffic congestion and air pollution are driving policy changes with increased use of transportation alternatives such as carsharing, ridesharing, electric vehicles, and autonomous vehicle technologies, he said. 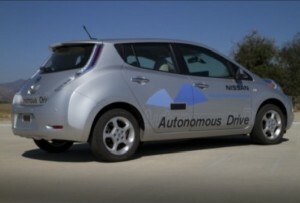 Nissan would agree on the nexus and integration of EV and self-driving technologies, as you can see in the Nissan Leaf photo above from the automaker’s 2014 Autonomous Drive Car test program. Here’s a look at the latest developments in OEM strategic planning on the integration of electrified and autonomous vehicle technologies……. Along with Doug Parks, GM is appointing to its new Autonomous and Technology Vehicle Development Team: Pam Fletcher, executive chief engineer of global electric vehicles, and Andrew Farah, chief engineer of global electrified vehicles. Scott Miller, current director of global C02 strategy, and Sheri Hickok, current chief engineer of GM’s Next-Generation Light Duty Pickup, will also join the team. Hickok will become executive chief engineer for “autonomous joint ventures and fleet execution,” GM said. GM is investing $500 million in ridesharing company Lyft and has acquired the assets of Sidecar, the third largest ridesharing company in the U.S. after Uber and Lyft. GM President Dan Ammann last month said GM would partner with Lyft to create a network of autonomous cars for hire and a set of ridesharing services. In late January, GM also announced the launch of Maven, a carsharing service allowing users to access a Chevrolet vehicle on the new Maven mobile app for as little as $6 per hour, similar to what Zipcar offers. In the driverless car space, GM will it launch its “Super Cruise” semi-autonomous driving technology for Cadillac next year. While Apple won’t comment on its strategic plans for autonomous and electric vehicles, its hiring practices indicate something is in the works. Jamie Carlson, former “Autopilot Firmware Manager” at Tesla Motors, joined Apple in August to work on a special projects team at the company. Along with Carlson, new-hire colleagues at Apple include Megan McClain, a former Volkswagen engineer with expertise in automated driving; graduate researcher Vinay Palkkode who came from Carnegie Mellon; and Paul Furgale, the former deputy director of the Autonomous Systems Lab at the Swiss Federal Institute of Technology. Apple seems to be considering making in an investment in an autonomous vehicle testing ground at the GoMentum Station in Concord, Calif. Earlier in 2015, news leaked out about Project Titan, the possible code name for Apple’s electric vehicle program. Apple has likely set up a lab to test out a vehicle that looks like a minivan. Several hundred employees were working on the project. Google hasn’t commented on how its self-driving car research and development could tie into future EVs. Google has been putting a lot of test miles on its fleet of autonomous electric cars in use on the roads around the company’s Mountain View, Calif., headquarters. As part of Tesla’s new Version 7.0 software package in the Model S, Autopilot was transmitted to cars in the U.S. in October, which was then followed by Europe and Asia. Tesla’s new Model X sport utility vehicle also offers Version 7.0 and Autopilot. Customers must pay a one-time fee of $2,500 to activate the self-driving software when they buy a car, or $3,000 to activate the feature after delivery. The software update uses cameras, radar, ultrasonic sensors, and data to steer down the highway, change lanes, and adjust speed in response to traffic. The driver can follow a lane on the highway and change lanes using the turn signal. The 7.0 software and Autopilot can deliver parallel parking that detects an open parking space and takes control if the driver asks for the car to park itself.